Are Antibacterial Products Worth Their Cost? These days, there are many varieties of hand soaps, including antibacterial lines, but when it comes to hand-washing, are antibacterial products worth the extra cost? Here's the scoop: In order for antibacterial soaps to work properly, you need to lather for two minutes before rinsing. That's right, two whole minutes. Since most people don't spend that much time washing their hands, the extra chemicals don't even get a chance to do their job. 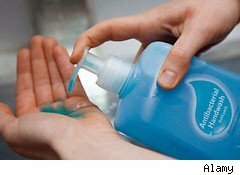 Prolonged use of antibacterial products can also strip your hands of both unhealthy and healthy bacteria, which leaves room for more resistant strains to take hold. So, when it comes to savings, you're better off going with a regular liquid soap. A 9-ounce bottle retails for $1.89, and for the same price, you can get a three-pack of bar soap, which works out to 63 cents each. When you're not near a sink, hand sanitizer is the next best option. An 8-ounce bottle costs between $1 and $5, depending on the brand. Just be sure to choose an alcohol-based product -- it gets rid of the bad bacteria without harming the good kind. So, when it comes to keeping your hands clean and your budget tight, choose regular liquid or bar soap. If you're on the go and can't get to a sink, alcohol-based hand sanitizers are the next best thing.